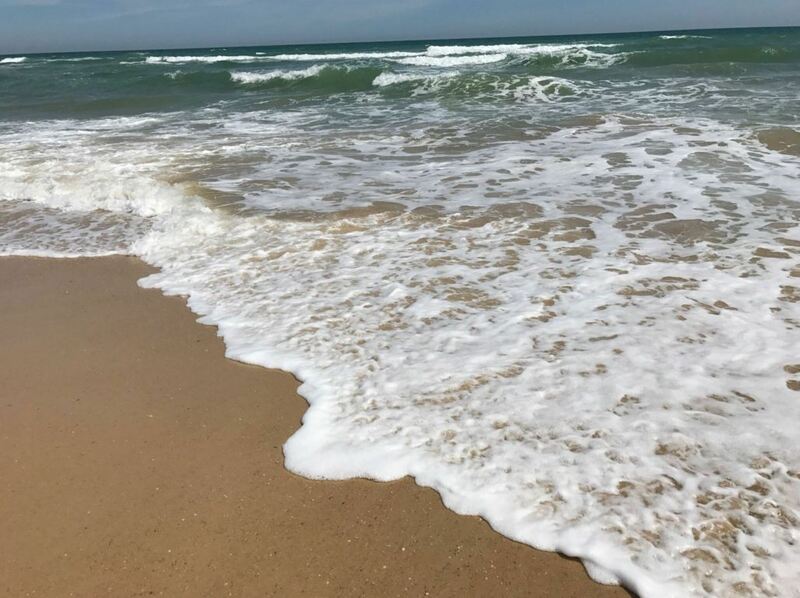 Meia Praia is one of the longest beaches of the Algarve. It is the perfect beach if you search peace, quiet and cleanliness. Never overcrowded, an excellenct choice for long beach walks and running. Close to the town of Lagos, this is a favorite beach for many locals and tourists all year round. Curious to see Meia Praia? Then watch the short video below to get an impression. Literally, Meia Praia means half beach. This does not refer to its size. Meia Praia stretches for about 4,5 kilometers and is quite wide, making it the largest beach in the region of Lagos. 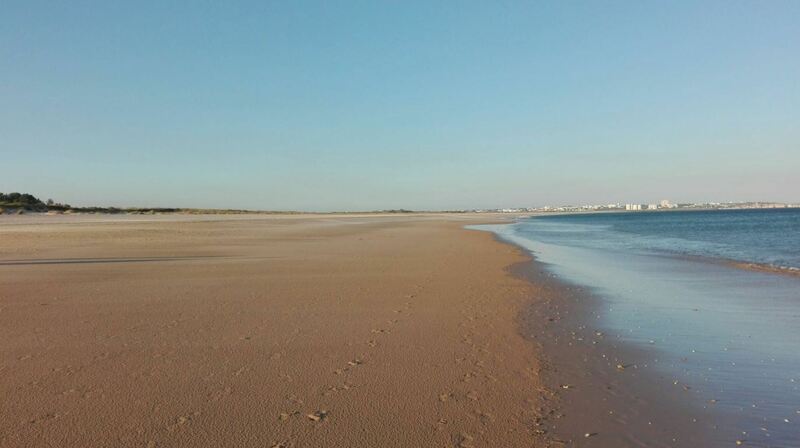 It is actually one of the longest beaches in the entire Algarve. 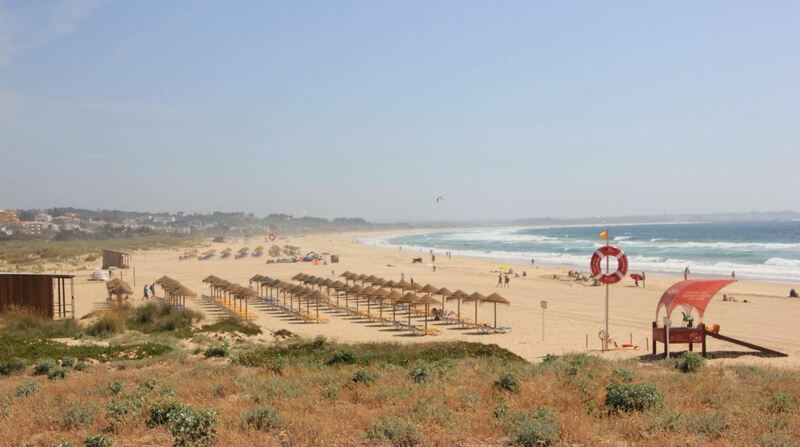 The beach runs from the eastern side of Lagos all the way to Ria de Alvor, forming a big natural bay. 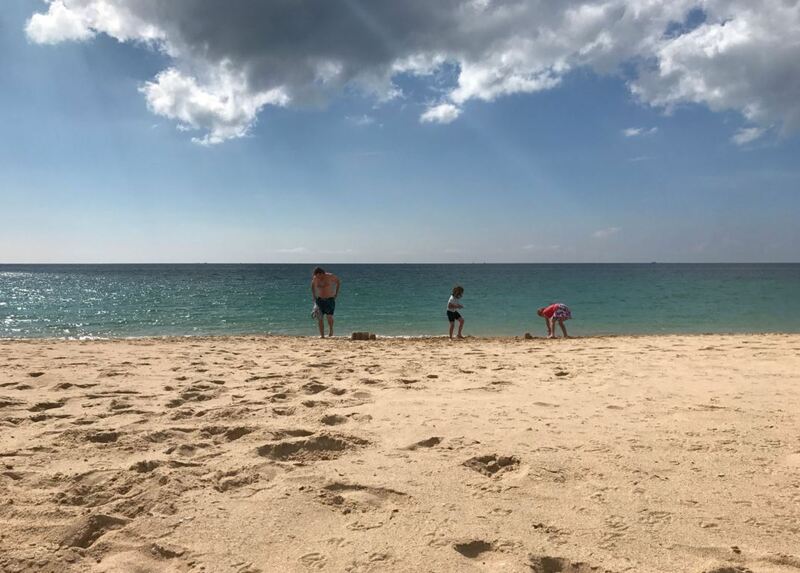 The name Meia Praia in fact refers to half of the long strip of sand from Lagos to Alvor (which is now divided by the river Ribeira de Odiáxere). The sand on the beach is nice and very soft. It feels great to walk on this beach barefoot. Meia Praia is a very clean beach. The sea here is very clean. The rock formations of Ponte da Piedade protect Meia Praia against waves from the southwest. This is why the sea here is relatively calm. There are no rocks in the water, which is great for swimming. Be warned that the sea can be very cold, even in the summer. The sea is very shallow at first and gets deeper very slowly. 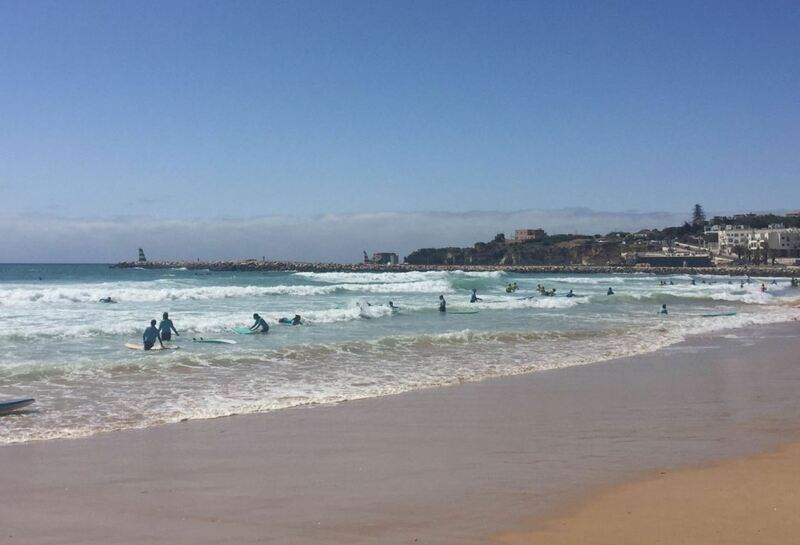 This makes it a good beach for families with young children. 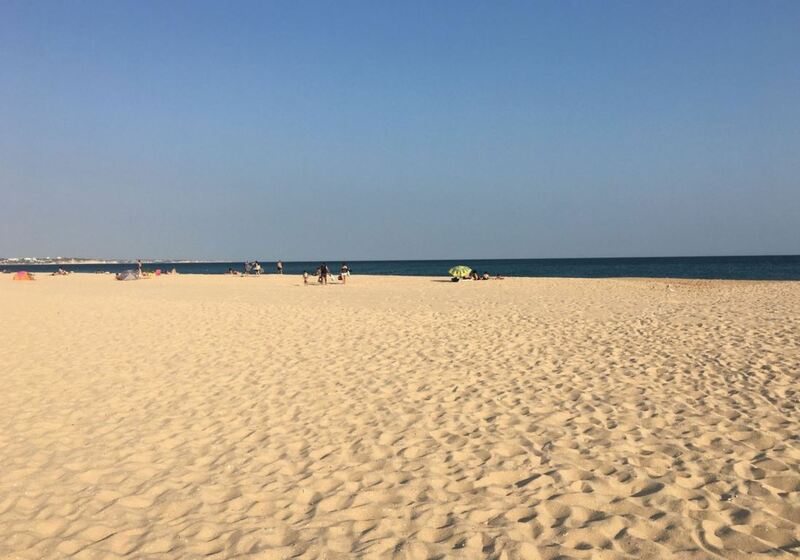 The beach is thus popular among Portuguese families, but also tourists find their way to this beach in the summer. In the summer, the beach attracts many people. 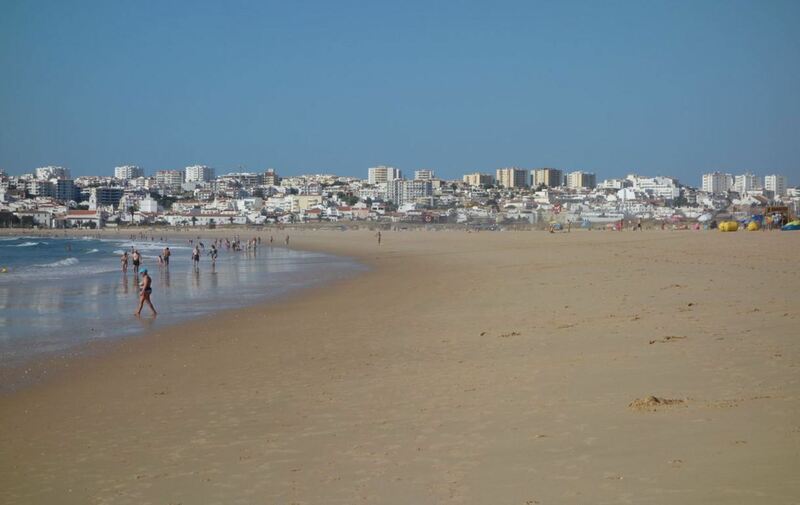 However, the size of Meia Praia is also the biggest advantage of the beach. There is plenty of room for everyone. Even in the height of summer it is easy to find a good spot on the beach. It feels uncrowded, even when many people are on the beach. The busiest part of the beach is the western side, because it is close to the marina of Lagos. From here, the more you walk to the east, the more quiet it will become. The eastern side of the beach is much less touristic than the western side. This part of the beach is perfect for people that like privacy, but want to stay close to a big town as well. Unlike other beaches in Lagos (like Dona Ana and Camilo), Meia Praia is not surrounded by cliffs. The beach is backed by dunes. This makes that the beach can be quite windy on some days. Make sure to bring a parasol, which protects you from both the sun and the wind. And just as important: anchor your parasol securely into the ground, otherwise it might fly away. The wind on this beach also has its advantages. 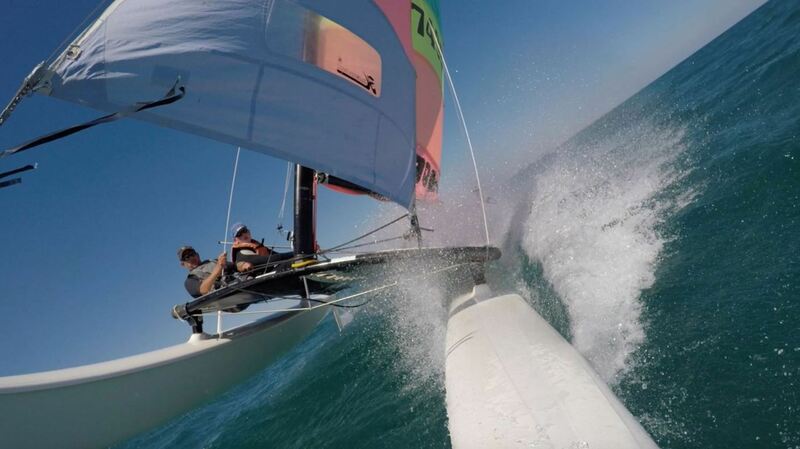 You will find a great variety of water sports here, including surfing, paragliding, sailing, windsurfing, jet skiing, kayaking, stand-up paddle boarding and kitesurfing. If you don’t have any equipment, don’t worry, you can rent it on the beach. 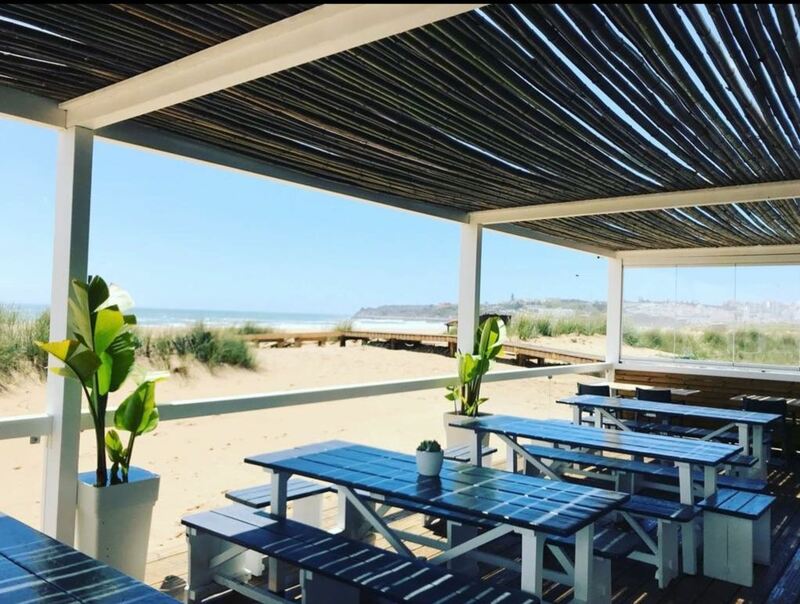 From Meia Praia, you have a great view over the city of Lagos. The beach almost feels like a city viewpoint. On a clear day, it is possible to see quite far as well. To the west, it is possible to see as far as the coast of Sagres. 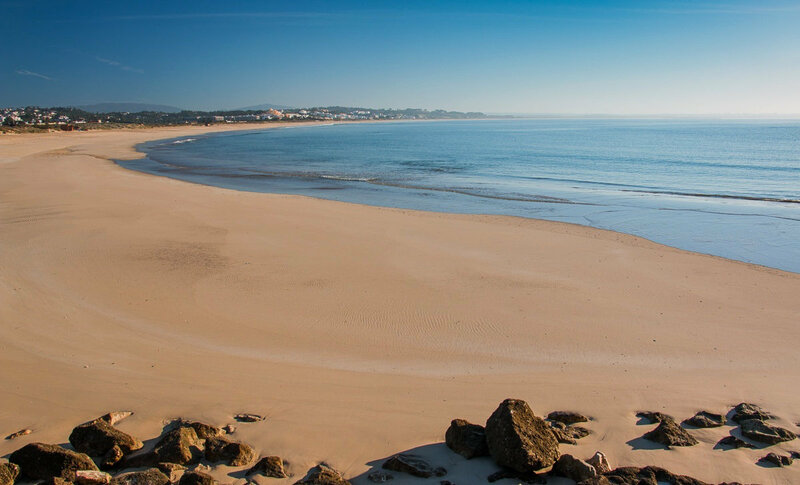 To the east, you can see Alvor, the beaches of Portimão and even Carvoeiro on the horizon. East of Meia Praia, you can find Ponta da Piedade and the other beaches of Lagos, including Camilo and Dona Ana. 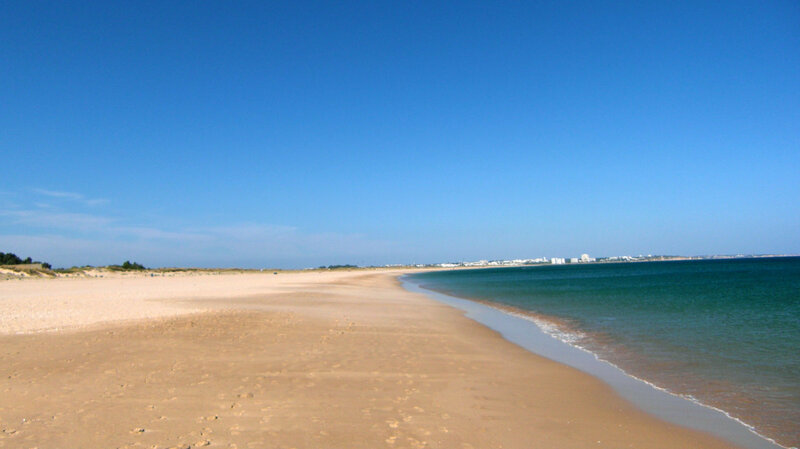 West of Meia Praia lies the beach of Alvor and Praia dos Três Irmãos. Lagos has so many nice things to see and do, it really is one of the best towns to visit when you are in the Algarve. The size of Meia Praia makes it perfect for long beach walks or running on the beach. It is so peaceful to just walk along the ocean and hear the sound of waves and seagulls in the background. The best way to walk is to the east (to the left when you are looking at the ocean). The further you walk east, the more quiet it will become. If you walk far enough, you will even reach an area where nudism is allowed. The eastern side of the beach is quite popular among naturists and dog owners. 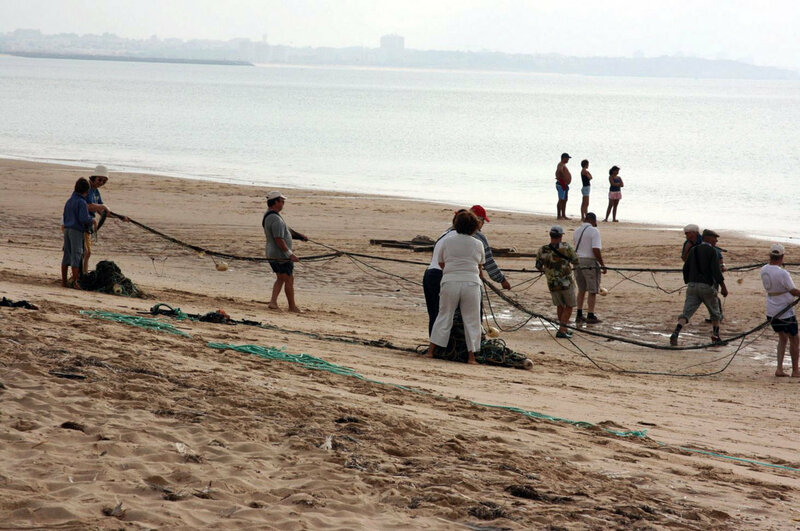 If you are lucky, you can see local fishermen bringing in the traditional nets to catch fish. The western side of Meia Praia is sometimes called Praia de São Roque. Here you can also find the São Roque restaurant. The eastern side of the beach is sometimes referred to as Praia do Vale da Lama. Even though a different name is sometimes used, these parts of the beach all belong to Meia Praia. It is possible to get to Meia Praia on foot or by car, bus, train or water taxi. If you are in the marina of Lagos, the beach is only a couple minutes by foot. You can literally cross the bridge in the harbour and you will be on the beach in minutes. If you come by car, there is a road along the beach, called M534. There is plenty of space to park your car near the beach. The more you are on the eastern side, the easier it will be to find a parking spot. 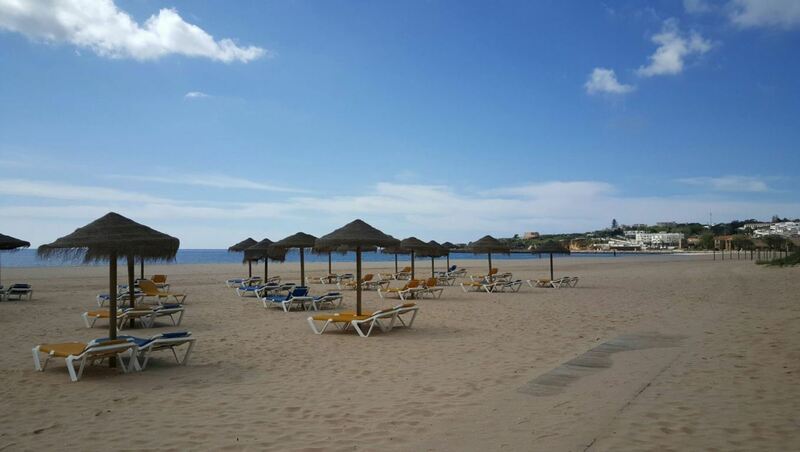 When you go by bus, you can take bus number 2, which follows a route along several beaches, including Porto de Mós and Dona Ana. Buses usually go every hour. There is also a small train station at the eastern, more quiet side of Meia Praia. However, the train goes at very irregular times, so going there by train is not recommended. Finally, it is also possible to reach Meia Praia by water taxi. You can take the water taxi from Avenida dos Descobrimentos in Lagos. The boat takes you over the estuary near the town center. Would you like to go on an adventure? That is possible, because there are many exciting excursions in the area of Lagos. What about exploring Ponte da Piedade or see the coastline of the Algarve by boat? Some of these excursions you can already book online. Below you can find our favourite excursions in this area. Apartamento Nora. This apartment is located near the middle section of the beach and offers great value for money. Highly rated. Marina Beach Apartment. Located right near the marina, this hotel is one of the highest rated in the area. T3 Colombo. This modern apartment is located near the marina and offers everything you need for a great holiday in Lagos. Onyria Palmares Beach House Hotel. This five star hotel has an outdoor swimming pool and a great restaurant. This hotel is located almost two kilometres above the east side of the beach, a bit further from the center. Many possibilities for hiking and cycling nearby. Excellent if you prefer a peaceful holiday. 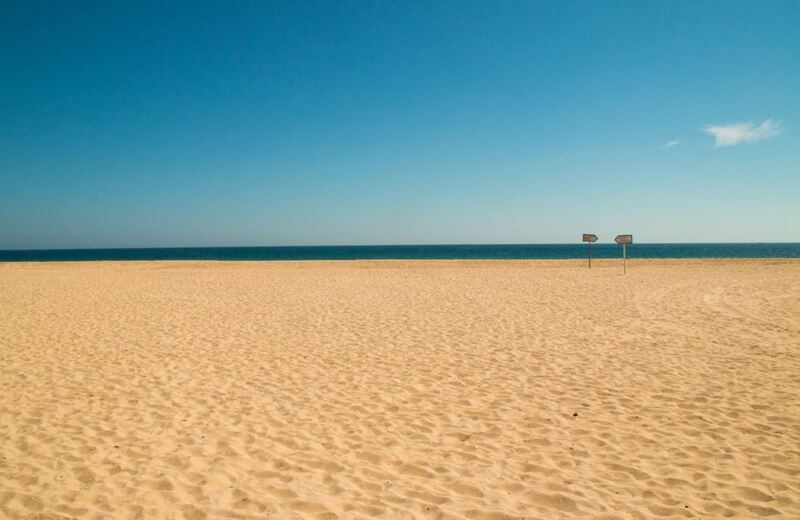 Since Meia Praia is such a big beach, make sure to check the location of your hotel before you book it. 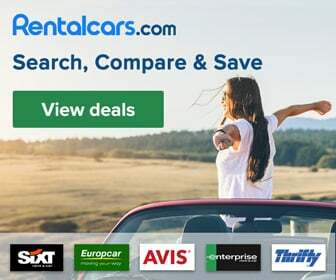 It could be disappointing to find out that your hotel is far from the center of Lagos and requires a taxi drive. On the western side of the beach, near the marina of Lagos, there are more facilities than on the eastern side of the beach, which is more quiet. There are plenty of sunbeds around. Lifeguards overlook the tourists on several parts of the beach. Also, many kinds of water sports are available. The beach is furthermore accessible by wheelchair. Finally, there is a 18 hole golf course above the eastern side of the beach, called Onyria Palmares Golf.